Council didn’t know own light rail plan? Behold! A rough depiction* of City of Canning’s staff’s light rail plan…. It seems the Councillors of Canning were taken by surprise when news of route popped out at a recent Agenda Briefing. The Barnett Govt’s vision for Perth’s future transport network, Transport @ 3.5 million, doesn’t mention a light rail for Cannington, in fact the City’s response notes “…. 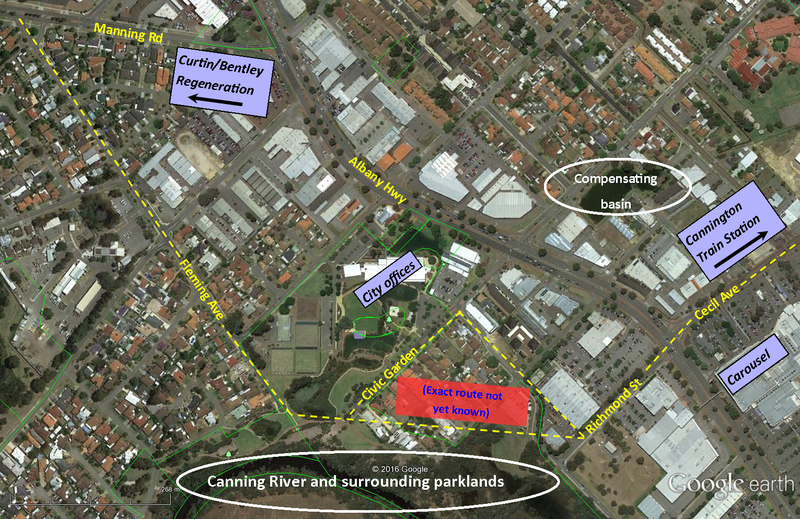 it neglects Cannington in its role as a strategic activity centre in the south east metro area”. WA Labor’s MetroNet doesn’t feature light rails…. what you’re looking at above appears to be the wishful thinking of Curtin University and staff at the City of Canning. So just how feasible is this plan? Is it “nice to have” not “necessary to have”? Financially viable? Environmentally responsible? It certainly seems concerning – not only does it appear neither Council nor community were involved in the route selection process, it potentially packs light rail in to tight spaces, existing development, over parks, filtration systems, perhaps even bowls over Cannington Bowling Club and takes heavy infrastructure close to Canning River and surrounding habitat. Just how much more bushland is Canning prepared to rationalise over, with news last week the WA Planning Commission (WAPC) is advertising for comment on plans to rezone four hectares of Bush Forever to “Other Regional Road Reservation” for the Jandakot Airport Eastern Link Road – a road the ratepayers of Canning will be expected to pay a large part of the cost to build, unlike Jandakot Airport itself? We knew that Canning’s new CBD Plan, which the Council authorised staff to go ahead with at least a year before the WAPC agrees to it, would feature alignments and provision for a light rail system. Main Roads had been clear in its submission to the CBD proposal that the two additional lanes wanted along Albany Hwy, to create a fast transport system to Curtin, were unlikely. Curtin has committed to deliver a new bus interchange as a key component of the overall Greater Curtin Master Plan and forms part of Greater Curtin Stage One. This interchange is intended to be the central public transport hub for Curtin and is to be situated adjacent to a proposed new light-rail service connecting the campus with the Perth CBD, Canning Bridge and Cannington. Next came Councillor Ben Kunze and Patrick Hall’s motion to Council that the City prepare a response to Perth @ 3.5 Million that advocated a light rail link between Curtin and Cannington Train Station. It appears plans were already underway however as the City had produced a Draft Manning Road Light Rail Pre-Feasibility Study (2016). Finally, as Council discussed the City’s submission to Perth @ 3.5 Million, news broke in the room that a light rail route had been identified, that [Dept of Transport, PTA, etc had “signed off on”] etc. Very exciting, but still not very clear. Draft Manning Road Light Rail Pre-Feasibility Study (2016) – also a recommendation of the Integrated Transport Strategy, this project looked at the space required to accommodate light rail from Curtin University to the Canning City Centre and the land take/rezoning that should be planned to secure land for such a project. It is envisaged that the light rail would run from Curtin University eastwards along Manning Road to Fleming Avenue, before proceeding in a yet to be determined configuration from Fleming Avenue to Cecil Avenue, then along Cecil Avenue to the Cannington Train Station. However, it does appear the councillors were simply unaware that a light rail route was close to finalisation. Ben Kunze, Councillor and Mike Nahan’s electoral office researcher, blurted out he wasn’t aware Canning was going to do a light rail? Councillor Pauline Tarrant said she’d like info…. and the next day people suddenly began accessing this blog for light rail information! from Civic Gardens the rail would cross to Fleming Ave and then on to Manning Road and then Curtin University. The Manager Engineering Services advised that in the Department of Transport’s (DoT) Integrated Transport Strategy, referral is made to a light rail or bus rapid transit route between Curtin University and the Cannington Train Station via Manning Road and Fleming Avenue to the City Centre. The DoT Strategy will be available for presentation to Council in the near future. Where it gets tricky is in the detail. Albany Hwy transports huge numbers of cars and Carousel is on track to increase itself by 50%, including parking. A light rail will only add to our congested heart – so will the rail go through or under Albany Hwy? What river authorities or river guardians will go along with rail so close to a river and natural habitat? Cannington has several compensating water basins for rain water, which filtrate water including that coming from the Belmont industrial area, apparently. How will this be affected? Remember Archie Martins – the electrical and home appliances empire? The family donated the land used today by the Cannington Bowling Club (situated between Fleming Ave and City offices). It will be close to were the light rail would go, but the land carries caveats on usage as part of its bequest [Edited 15 Feb 2017: Clarification. Representative of the Martins family has confirmed that whilst it sold parcels of land in Cannington 20yrs ago, none included George Street West, and none of the sales specified conditions on usage thereafter]. Who exactly is this light rail to serve? Canning has been boasting of its “retail living” to come, and I understand Curtin will not cover all retail needs onsite as part of its master plan, but is that a reason to build a light rail – so people can do their shopping at Carousel, or is this, as we should all be questioning more closely, another bid to serve Curtin and turn the CBD in to one giant student accommodation precinct? Speaking of Curtin, in its response to @ 3.5 Million the City of Canning stated “The [overall metro] Plan could be enhanced by including detail on proposed funding and prioritization mechanisms for projects”. That’s a good Q to put to Curtin right about now: will it be contributing to any light rail project cost? A light rail between Curtin and Cannington would not be a priority, it would not attract sufficient patronage. It would therefore more likely be viewed as an overflow mechanism applicable decades down the track. However, Canning is developing a nasty little habit of putting things in place whilst giving the appearance that it will be open to change, when in fact that option was never really there. The far more likely reality to all of this is that an alternative option to prioritize buses needs to be found. Those buses could well be turned off Albany Hwy at an early point and run through areas closer to the river, and up Fleming Ave. It would come with consequences but it would free buses from the traffic of Albany Hwy, the entrance to Manning Road and the many, many traffic lights along this section of Albany Hwy that taxi drivers hate so much. This action wouldn’t pave the way for light rail in and of itself – frankly it isn’t far to Curtin. If we can’t give the buses a priority lane then giving them an alternative route could be highly efficient. New Transport Minister Marmion, a known bus-over-rail guy would love it. Light rail in this instance isn’t necessary, and especially if it swings close to water and natural habitats. Canning’s submission to @ 3.5 Million includes acknowledgement that, whilst controversial, the Roe 8 extension and Perth Freight Link will “improve freight movement from Welshpool to the coast and may remove heavy vehicles from Leach Highway improving traffic congestion for the local community”. The City is also requesting Bus Rapid Transit between the Canning City Centre and the Perth Airport and expansion to the cycle network to include the routes outlined in the City of Canning’s draft Cycling and Walking Plan 2016 including cyclist/pedestrian bridges over Albany Highway and over the freight line in Canning Vale. #Councillor Patrick Hall was unwell on the day of the Agenda Briefing and not in attendance. Canning’s fab new City plan just collapsed?